Garden of Five Senses happens to be my first post from Gurgaon. Yes, I am back in Delhi, Gurgaon to be precise, almost after seven years and the place has changed beyond recognition. I often find myself struggling to make my way through the maze created partially by time and partially by upcoming constructions especially the metro. During my last stint in NCR, I do not remember exploring it too much, the reasons I am unable to think. But now after having a taste of wandering in the south, coupled with the fact that I have bandwidth on hand, I keep looking out for interesting things that can be done in NCR. One such search led me to Garden of Five senses, Delhi. I visited the garden almost a month back when it was hosting a festival and appropriately a flower festival. This relatively new garden is located in Said-Ul-Azaib village, in the Mehrauli heritage area. To reach this place you have to crawl through quite a bit of traffic. Apparently, sometime down the line, a metro line should take you straight to the garden. Designed to stimulate our five senses with its attractions like the touch, smell, hear and see our natural surroundings and taste some good food in the restaurants on its premises. A leisure space for the public, a place to socialize and unwind in the megapolis. It is spread in about 20 acres of land, not too big for a garden. But then not too small considering the location it is in. There are interesting animal figures created with steel and hedging plants, displaying topiary skills. There is a bit of a touch of Mughal era, through the terraced garden with slow flowing water, there are walkways that spiral across the garden. This can at times can create the feeling of being lost and losing your way. There are a variety of plants. There are paths created to pamper your sense of smell, where you can walk and smell the surrounding plants. The natural terrain provides a good backdrop of rocks, you can actually climb some of them and get an over the top view of seemingly distant Delhi. There are occasional art pieces scattered around the garden, mostly made out of metal. At times made of clay and stone. There is a solar park that displays various vehicles and equipment that run on solar energy. There are several artworks on display in the gardens representing an amalgamation of modern and traditional art by the established masters and young artists. Garden of Five senses is not only interestingly named, but it has also been planned as a venue for public functions like hosting musical shows in the perfect natural surroundings. There is a small amphitheater built with rustic sandstone tiles which can be used for events with a small audience. There are fountains that can provide respite from heat during summers. And also provide a romantic backdrop for musical evenings. Besides cultural events, this place is also popularly used for food festivals, Delhi tourism festivals, and dandiya. To make the place commercially viable, there are a couple of high-end restaurants in the premises and retail space which is still under construction. A few stores already operating out of this place are upmarket ones, belonging to designers and some of the interesting concepts. There was one store which had merchandise made out of old newspapers, all kinds of things including curtains and stuff for daily use. I would look forward to more such concept stores, though they are awfully expensive for an average pocket. There is an entry ticket which is quite nominal. But once you are in the place it appears to be designed to cater to the upper section of the society leading to a bit of dichotomy. Do enquire before you go. Developed by Delhi Tourism Development Corporation and inaugurated in 2003. A nominal fee is charged for carrying a camera inside. However, permission for a professional photo shoot on the premises would cost significantly higher. Do check accordingly. When we went to the Garden of Five Senses a flower festival was going on. We got an opportunity to see and click a lot of colorful flowers which were in full bloom. Strolling among a huge variety of garden flowers on the show is itself worth the time & very refreshing from the city life. Sharing some of the pictures. At the fag end of Delhi winters, the flower show is held here. A competitive display of garden flowers of various colors and color combinations are kept on display by the participants like the corporates, nurseries, individuals, flower seed marketers etc. Some of them also have stalls selling the plants and seeds of flowering plants. You may buy them for your personal gardening hobbies etc. Colorful flowers like Dahlias, Roses, Daisies, Gazanias, Primrose, Cosmos, Pansies etc and many varieties of Cactus can be seen during the show. There are prizes to be won for the best gardening flowers. A nice place for once in a year visit, when the weather is just perfect in Delhi for an outing. Every February The Garden of 5 Senses hosts tourism festivals like flower exhibitions contests, food festivals, different Melas, Dandiya festivals and folk music program. The weather is also perfect at this of the time of year to spend a day amidst nature enjoying the best that the garden exhibits. 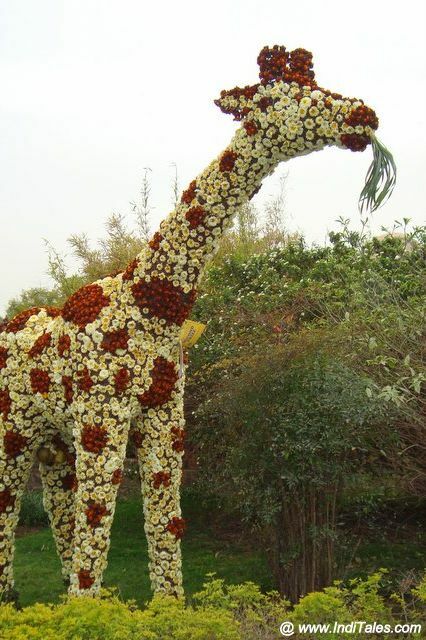 Delhi Tourism site says the Garden has been designed to the imagery suggested by the name Garden of Five Senses. Colour, fragrances, texture, and form all come together in an evocative bouquet that awakens the mind to the beauty of life and invokes a grateful prayer for the gift of sight, sound, touch, smell, and taste. On a lazy day, if this area is not too far from where you stay, you can go for a stroll or have a nice meal in the natural surroundings. Recommend you spend half a day during weekends in this beautiful garden in the right season. Recommend you to read following Delhi Walking Tours, Travel Blog posts I have covered. I was in Delhi but never been there as a visitors. Last of April I am visiting. And now will visit delhi as a visitor. Thank you Harshita, yes the flowers are lovely.